BOSTON (CBS) — That was not a New England Patriots game. Sure, they wore the uniforms, and they played in Gillette Stadium, but the similarities ended there. Tom Brady wasn’t in the building, and essentially any player whose jersey is purchased by fans was not playing. Wes Welker, Rob Gronkowski, Aaron Hernandez, Brandon Lloyd, Jerod Mayo, Vince Wilfork, and a whole bunch of others were not in action on Monday night. Hell, even the stadium itself wasn’t fully there, with the entire section of seats behind one end zone missing due to the late summer concerts at Gillette. So really, when it comes to the hard-hitting analysis and takeaways from this one, it all comes with a grain of salt. Actually, it comes with several grains of salt. Still, there are a few leftover thoughts to sort through after the Eagles’ 27-17 win in Foxboro. –I’ll try to limit my comments on the ESPN commentary, because really, they’re working a preseason game in Foxboro with most of the recognizable players not even in uniform. They deserve to be cut some slack. However, everybody’s favorite, Jon Gruden, didn’t hesitate to compare LeSean McCoy, a good back in his own right, to perhaps the greatest running back of all time. Gruden prefaced his comparison with “I hate to say this,” but went on to say LeSean McCoy reminds him of Barry Sanders. Yes, that Barry Sanders. Right on cue, McCoy took the next handoff and got absolutely wrecked by Brandon Spikes. I’m pretty sure Barry Sanders, even right now at age 44, wouldn’t get popped in the open field by Brandon Spikes. –Mike Tirico, when reading the list of Patriots’ inactives, said it “looks like a Pro Bowl roster.” So just remember that fact if anyone in your office is hyperventilating over the crushing preseason loss today. 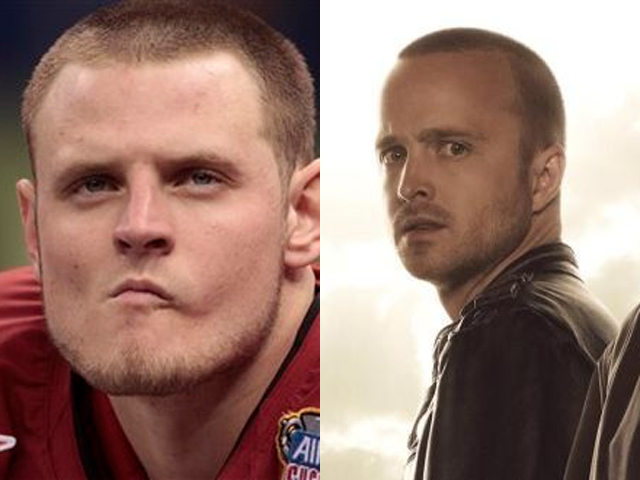 –I don’t think Ryan Mallett is a great NFL quarterback, but I’m impressed that he finds the time to practice, considering all the time he spends in the lab with Walter White. What, you don’t think so? –The Patriots’ offensive “starters” held their own, and I gave them credit in this week’s “Four Ups, Four Downs” for taking an 11-0 lead over the starting Eagles defense. However, they were definitely bailed out a couple of times by Philadelphia penalties. On the same drive, Nate Solder was saved by a roughing the passer and defensive holding penalty, the first negating an interception and the second taking away a third-down sack. –Marcus Cannon also looked completely out of his element at right tackle. Even if Sebastian Vollmer can’t bend over to tie his shoes, that position belongs to him. –While I think the offensive line should be a major concern at this point, there is this bit of relieving news from the Globe’s Greg Bedard: “Fun fact that may only interest me: Brian Waters still has a locker in the Patriots’ locker room.” Given how porous the offensive line has been through two preseason contests, I’d venture to guess that fact interests several others in New England right about now. Q: Can you speak about playing three games in a 10-day span? Q: Does that affect your preparation? BB: It is what it is. We don’t make the schedule. –I said it in the “Four Ups, Four Downs,” but I think Monday night’s performance was all Deion Branch needed to secure a roster spot this year. He just has a knack for making big catches that keep drives going, and that proved true no matter who the quarterback is. When Ryan Mallett faced a third-and-5 at midfield, he looked to Branch and gained 20 yards. When Brian Hoyer faced a third-and-13, he connected with Branch for 17 yards on a perfectly timed in route. And you know there’s nobody Brady trusts more than Branch. Branch did all the things Branch should do, and while I thought it was possible he might lose his job due to the logjam at receiver, I think he secured his spot on Monday night. –I sure hope he did, too, because nobody answers questions more honestly than Branch. He didn’t play at all in the first preseason game, so a reporter asked him if getting back on the field was just like riding a bike. –I don’t think you can judge either quarterback too harshly, given how poorly the offensive line played. Still, I thought Brian Hoyer looked skittish, and his final numbers (5-for-17, 55 yards) were indicative of that. I also didn’t love his postgame comment on Mallett. “Obviously, he did a pretty good job tonight and that will make me step up my level, too,” Hoyer said of Mallett. When the fourth-year guy is feeling the heat from the second-year player, it might be good for the team, but it doesn’t sound too good for the fourth-year guy. –A lot of players were apparently allowed to go home. (Not surprisingly, the Patriots went ahead and told Rob Gronkowski to stick around on the sideline. You can’t let him roam free around Patriot Place on a Monday night without running the risk of him causing a scene at the Olive Garden and Red Robin.) So the NFL forces season ticket holders to pay full price for games the players aren’t even forced to attend? That’s a solid system right there. –DeSean Jackson staring down Nate Ebner after Ebner picked off a Nick Foles pass at the goal line and returned it 34 yards was among the most DeSean Jackson things DeSean Jackson has ever done. Getting up and celebrating like he won the Super Bowl after catching a pass in front of Sterling Moore also makes the list. –I’m going to say this now and hope I don’t have to say it again: Jeremy Ebert is not like Wes Welker, and Jeremy Ebert is not like Julian Edelman. OK? They have one thing in common, but they’re different football players. Nothing drove me crazier than a few years ago when analysts began referring to Edelman as a “mini Wes Welker,” even though Edelman’s taller and bigger than Welker and is just like any other slot receiver in the entire NFL. So let’s never go down that path again, please. OK? Thank you. –In a related story, Brandon Bolden is not BenJarvus Green-Ellis. I’ll not-so-boldly declare that right now. –Most of the starters didn’t play, but you have to like what you saw out of Stephen Gostkowski. He perfectly drilled a 55-yarder (which may have been good from 60), and he hit a 51-yarder as well. He finished 3-for-3 on the night after missing his only attempt against the Saints. Zoltan Mesko, for what it’s worth, got zero of his six punts inside the 20. –If you didn’t enjoy Monday night’s game, then you’re a normal person. And you probably won’t enjoy Friday’s game, as it’s the team’s last chance to get a good look at players before cutting the roster down to 80 next Tuesday. And the final preseason game is obviously the last chance the team will have to assess players before chopping that roster down to 53, so we really might not see much of the starters until Week 1 kickoff on Sept. 9. The preseason is always a chore to watch, but this one could prove to be especially painful. That’s the equivalent of getting a bad root canal. Hey, maybe that ought to be the NFL’s sales pitch to convince season ticket holders that they’re not getting hosed by paying full price for preseason games. Read more from Michael by clicking here, or follow him on Twitter @michaelFhurley.